Convience store managers say they have difficulty keeping Sun Drop in stock around Grundy County, Tenn. While stores in many parts of the country don't carry Sun Drop, Grundy County stores carry nearly every flavor. This vending machine outside a locally-owned pharmacy in Altamont, the Grundy County seat, is stocked with the area favorite. Grundy County doesn't have a proper grocery store, but health workers complain that convenience markets are well-stocked with sodas. "My sugar was high and I didn't know it. I started getting dizzy and thirsty all the time," says Wendy Norris of Grundy County, referencing when she discovered she'd developed Type 2 diabetes. "Of course, you know what I was drinking? Sun Drop. I was making it worse." This local fizzy favorite has become a bit of a public health challenge. There's no survey data to show a linkage between the small-batch citrus soda and Type 2 diabetes, but anecdotes abound. Randall and his wife Patricia Barrett represent a dual diabetic household in Grundy County where 16 percent of adults are diagnosed with diabetes. Randall blames Sun Drop. "I used to put those things away," he says. "Back in the '70s, I had a shop, right at the top of the mountain. I'd work 20 hours a day in that shop. I would drink 48 Sun Drops a day." "The small ones," Patricia chimes in. This was back when soft drinks were 8 ounces, not 12 or 20. But still, no one wants to do the math. Given the signage on stores and vending machines filled with almost all Sun Drop, one might think the Mountain Dew competitor, with a bit more caffeine, was some sort of hometown recipe. It's not. Sun Drop was born around 1950 in Missouri. It's now part of the beverage company Keurig Dr Pepper. But the rural reaches of Middle Tennessee have embraced the drink like no other. One bottler claims to be the third-largest vendor of Sun Drop in the U.S.
"You're in a special place. The only place it's available," one TV ad from a local bottler says, appealing to regional pride. "This is Sun Drop country. Other states just don't get it." Beyond the particular soft drink brand, it may be that there's a deep-seated cultural phenomenon at play, says Grundy County nurse and Type 2 diabetes activist Steve Wickham. This is a community with some of the highest uninsured rates and unemployment in the state. It's economically depressed. "When you have a really poor economy, there are things that the people will equate with luxury," Wickham says. "As a kid, it was a rare thing when you could get a soda." Now they're available everywhere. In a county without a proper supermarket, the corner stores can't keep their shelves stocked. Wickham is working on a radical project to reverse Type 2 diabetes in patients through diet and exercise, hopefully freeing them from lifelong medication. He says one of the first conversations is about dropping the sodas. Some people really treat Sun Drop like it's water. "It's a real big thing here in the county, 'Oh, I never drink water.'" That becomes a vicious cycle, says endocrinologist John Buse, who directs the diabetes research center at the University of North Carolina. Diabetes tends to make people thirsty. "The more they drink of that stuff, the higher their blood sugar, the more they pee. The more they pee, the thirstier they get," he says. "I would submit that if you're drinking two cases a day of Sun Drop, it would be impossible for you to not become obese. Now, being obese might be the least of your problems." Wendy Norris has now been converted into a dedicated water drinker. She says it's going to require generational change. "When you're a kid, your momma — I'm not saying anything about everybody's momma — but they hand you a cold drink, and I've done it, too," Norris says. "You hand that to your kid, and then when they grow up they think, 'I've drunk that all my life. It's not gonna hurt me.'" Norris is doing her part to break the cycle. In an effort to avoid type 2 diabetes, her grown daughter is reaching for water now, too. New data from the market research firm Euromonitor finds that sales of low calorie soft drinks in the United States fell almost 20 percent over the last five years. By 2019, sales are projected to fall off by a third since their peak in 2009. 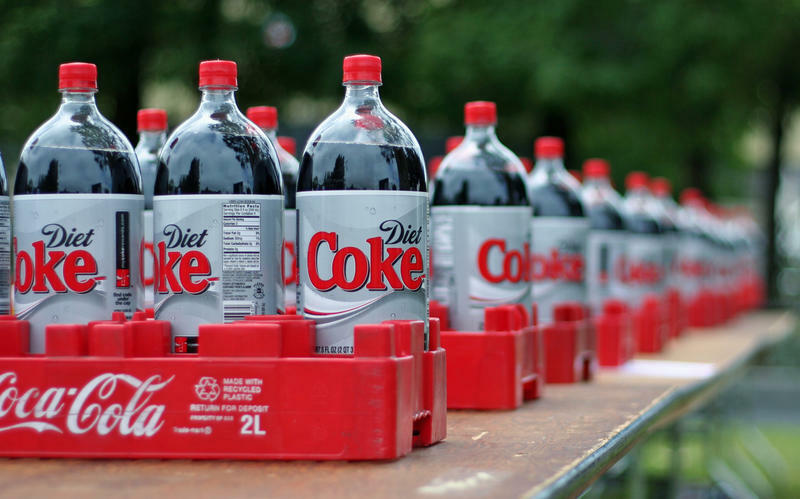 Diet Coke has seen its sales fall off by 15 percent in the past two years. Here & Now’s Jeremy Hobson looks at what’s happening in the soda business with Jason Bellini of the Wall Street Journal. PepsiCo reports second quarter earnings today. The snack and beverage conglomerate has consistently beaten estimates in recent quarters — even as Americans drink less soda than they have in three decades. Can PepsiCo keep the streak going?